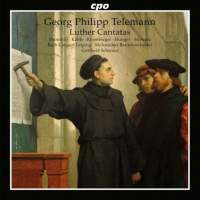 It is no surprise that Telemann, along with Johann Sebastian Bach and Christoph Graupner, can be considered the main composers of the Lutheran cantata during the first half of the 18th century. After all, the Harmonisches Gottesdienst was meant to provide first-rate but easily performable cantatas in cyclic form for the year for places that were missing larger vocal and instrumental forces, and this published set is only a small tithe of the works that he was to write for the church. Thus, calling this set of five works Luther Cantatas, as the title of the disc has it, rather begs the question of redundancy. Nevertheless, when three texts of that number are by Erdmann Neumeister, the main promoter of the genre, such a rubric should be accepted. These works are all outgrowths of the Magdeburg Telemann Festival, which annually seems to unearth and perform an almost inexhaustible supply of the composer’s music, and the 21st season was devoted to the theme of his connection with Luther. As was usual with Telemann, the structure of these cantatas varies considerably. The first, Herr, wir liegen für dir, is conventional, with pairs of arias and recitatives bookended by the choral “Dictum” and a final chorale. In the second, the usual recitative is omitted altogether, and it is prefaced by a nicely suspensive sinfonia, while in the third Telemann dispenses with the arias, allowing the threefold choral repetitions (two chorales and a final chorus) to be separated by brief recitatives, the second of which does have a brief devolution into a duet Dictum at the end. The movements can be rather conventional, such as his square setting of A mighty fortress in the final cantata Wertes Zion, or the other chorale tunes. But he also inserts moments of harmonic and melodic boldness, such as the tortuous melismas of the aria “Weg, ihr Sünden” in the first cantata, which get spun out by the bass as if to underscore the text “kränkt mich nicht” (do not constrict or grieve me). The second cantata even ends with a gnarly contrapuntal “Amen” fugue that seems startling, given the almost homophonic nature of the preceding chorales. Telemann is also quite inventive in terms of his use of instrumentation. In the first aria of the first cantata, “Was ich an Gerechtigkeit,” the two flutes (traversos) weave a gentle crystalline minuet around a flowing soprano line that is like a clear brook. In the first duet of the second cantata, Es wollt uns Gott, the oboes are wonderfully throaty, with their darker tone colors emphasizing some curious harmonic inflections that support the parallel thirds of the solo voices. In the last cantata, Telemann uses his high trumpets both as soaring clarion calls and as fanfares. In the chorus, “Seid böse, ihr Völker,” the admonitions of the voices are punctuated by a militaristic brass line, which is suddenly interrupted by plaintive minor-key insertions that provide abrupt and effective dramatic contrast. In short, these are all excellent examples of the Lutheran church cantata of the time, equal to the same sort of works that were being turned out by Bach over in Leipzig. Conductor Gotthold Schwarz keeps the ensemble clean and crisp, with a nice variety of tempos that emphasize Telemann’s contrasts. He also functions as bass soloist, with a light tone that handles the often twisting lines well. Soprano Siri Thornhill has a bright voice that can sound, as in the aria “Was ich an Gerechtigkeit,” innocent and reticent, just what the Affekt requires. Countertenor Stefan Kahle and alto Susanne Krumbiegel are flexible, as is the precise tone of tenor Tobias Hunger. In short, not only are these fine examples of Telemann’s style in cantata writing, the performances support and present them in a way that promotes their compositional features. My only quibble is that I seem to hear a pair of horns in the background of the straightforward chorale “Ein feste Burg,” which are not mentioned in the list of personnel. That does provide a nice support for the voices, but they should have been mentioned. Other than that, this is a disc that Telemann collectors will want. Recommended.